Editor’s Note: I’m really pleased and excited to introduce you to Weekly Leader’s newest contributor, Matt Howard. In addition to being an avid runner and mariner, Matt had a successful career in the United States Marine Corps which included service as the pilot of Marine One, the Presidential helicopter. Welcome aboard Matt! Yesterday’s run was a tough one. It was cold and the rain came heavy and steady. I did not dress out quite right and was reminded that rainy runs can be tough to dress for depending on the temperature. I thought the rain was going to be light and since it was about 40 deg out I figured my lightweight water resistant Mountain Hardware shell with a compression top underneath, light polypro gloves, tights and a ballcap would do the trick. Not so. 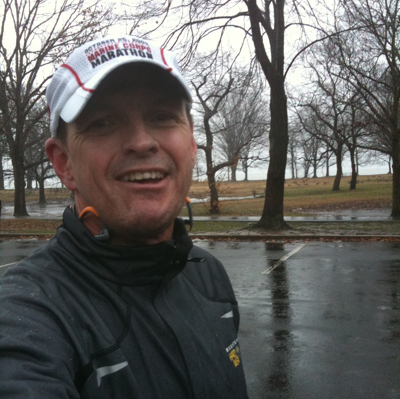 As I started the run the rain began to come down heavily. I contemplated, if but for a moment, heading back to the car and possibly drive back for more rain resistant gear. I was lured by the truism that there is no bad weather, only bad gear. These thoughts were weighed against the specter of running these 8 miles and whether or not it was worth it. Well, of course it was worth it. I elected to keep running. I ran away from the Belle Haven parking lot, which on a good day would play host to scores of cars whose occupants rode, walked, and ran along this most picturesque and pleasant stretch of the Mt Vernon Trail. I kept running away from my car and the parking lot, which on this day hosted my car and no others. I’ve spent my adult life weighing odds, namely by flying helicopters around for the USMC for 20 years. Odds which, on more than one occasion, held people’s lives other than my own in the balance. On some of those occasions, the occupants in my machine had nary an idea that such a drama was playing out. These experiences have made me a very analytical person, one who tends toward constantly evaluating conditions, and in particular, one who pays attention to those things over which I have control as well as those I do not, and being able to tell the difference. This is the sort of thought process in which I engaged the next 8 miles, powerless to change how I think, chuckling at myself while realizing it was just a run and not some sort of life or death situation. Somewhere around 3 miles in I became soaked through but was still able to keep my core warm. I began to think of what an accurate metaphor running is for life. For at the core of it, those who run are seeking to live a life well led. They are exercising basic leadership principles. I began to think about leadership and what an eminently practical exercise this rainy cold run had become. One of the tenets of good leadership is being able to do the right thing when nobody is looking. Because, in its essence, leadership is about getting a person or group of people to do something they would not likely do by themselves. For after all, if they did this thing perfectly well on their own they would not need a leader. In a leadership role, just when you think nobody is watching, you are wrong. A good leader must do what he or she says they will do and set the example all the time. It can’t be turned on and off. It must be lived full time. The savvy people one is meant to lead will require somewhere in the neighborhood of a nanosecond to determine whether you are genuine or not. Genuine as in believing fully what you tell them, as in instilling a sense of confidence that you know what you are about and are capable of leading in the first place. That you will take care of those in your charge and back them up to the hilt when challenged. You have to practice doing the hard things when nobody is looking, for it is at those times you are disciplining yourself to do the right thing no matter the conditions. And so, on the run went, a perfect break-in for the newGarmin 310XT, from which I would swipe the streaming water when I wanted to see mileage or pace. I sped up over the last couple of miles because my core temp was dropping and there was nothing I could do about it, save an attempt to produce more heat through greater exertion. When I splashed into the parking lot back to my solitary car, I snapped the pic above, glad to have finished the run. A retired Marine pilot, an aviation consultant, and a yacht broker who believes that leaders are made and not born. Well written my friend! Suffering by your self takes mental strength that most don't have. Thanks for the comment! Sometimes doing a hard thing alone will help focus an inward view that will likely serve well when faced with a leadership challenge.